The other week I was watching Know How on the TWiT network and they demonstrated a product called InstaMorph. It’s bunch of plastic beads that becomes soft like clay when heated, can be shaped into objects and will harden when it cools. One of the first things I used it for was to create some strain relief for cables that had started to fray. I used epoxy glue to seal the fraying part then after it hardened I put InstaMorph around the area for strain relief. 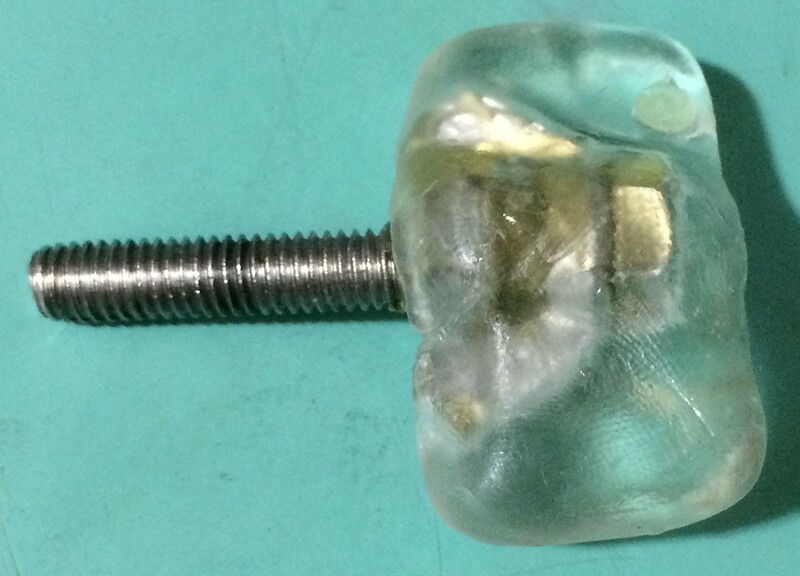 Note that InstaMorph becomes a somewhat hard plastic with little give unless you use a thin piece. 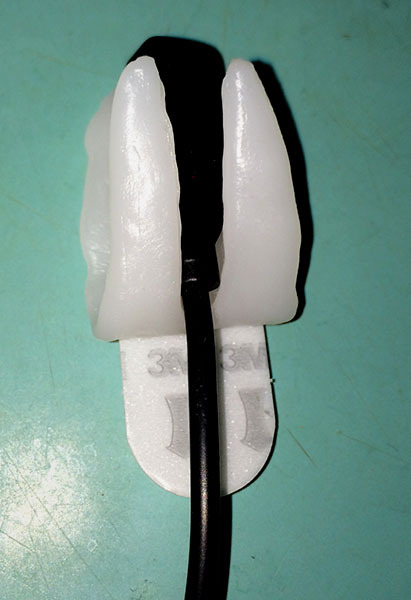 InstaMorph and some cable ends with strain relief molded onto the connections. Next was the knob for my Manfrotto tripod. The original knob had the threads on the inside nut strip so I couldn’t tighten the centerpost. 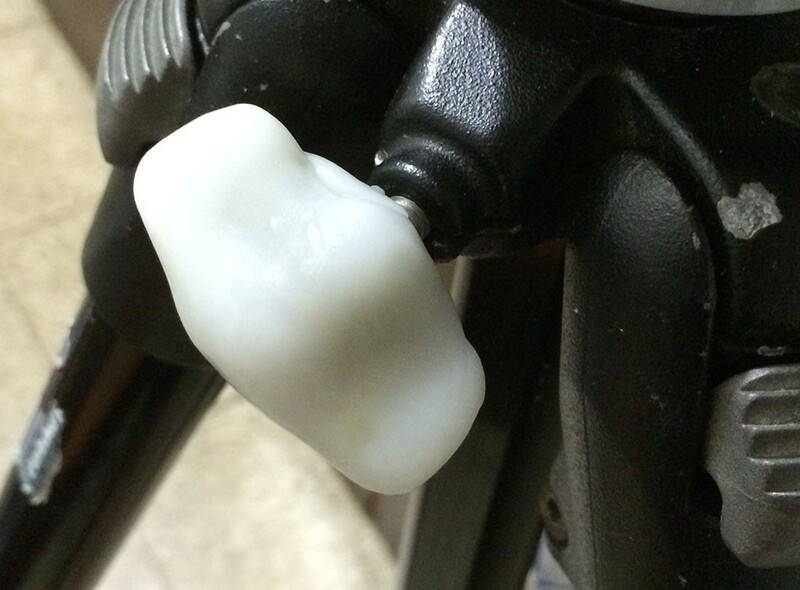 For the repair I took out the nut and knob assembly, found a replacement nut for inside the tripod assembly then for the knob I glued a bolt, wingnut, regular nut (to prevent the wingnut from moving) and epoxy glued it all together. This worked well as is but was a bit harsh against the fingers while tightening, see photo below. Homemade replacement knob base hardware for my Manfrotto tripod. 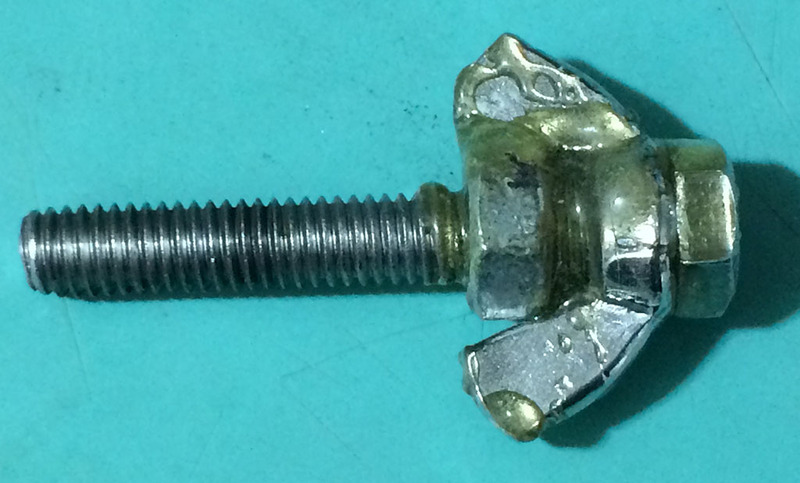 I used a bolt, wingnut to provide leverage and a regular nut to hold the wingnut in place along with epoxy glue holding everything together. Next step was to mold some InstaMorph around this makeshift knob. Homemade replacement knob for my Manfrotto tripod cooling so it’s transparent. Finally here’s the now comfortable knob on the tripod. Replacement knob on my Manfrotto tripod. I could paint the knob black to match the tripod but I think I’ll leave it the way it is. If for some reason I need to redo it I can always reheat the InstaMorph knob in some hot water and remold it. I’ve also used this to hold together some reading glasses I use at home that had broken at the hinges or along the earpieces. Doesn’t look pretty but they’re just glasses I use at home when working on things close. Thumbs up for this product which allows me to create things without the expense of buying and learning to use a 3-D printer. Hints: I put the IM beads in a low coffee cup and use my espresso machine for instant hot water. This allows me to use additional hot water as needed during the fabrication process. When I need to mold the IM into a flat side I use Reynolds Non-Stick Aluminum Foil. Some foil on the countertop with the non-stick side up allows me to flatten the IM onto it for a perfectly flat shape without sticking to anything and picking-up gunk. I also put the foil onto a piece of camera gear that I wanted the IM to mold to but not stick to. 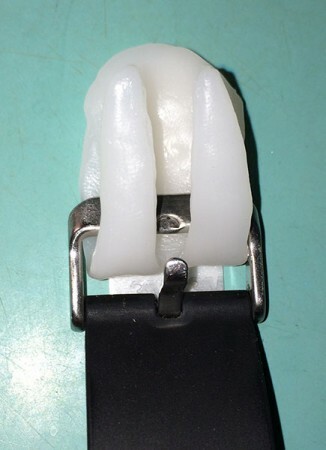 The InstaMorph Pebble Watch holder after being shaped before being bent. 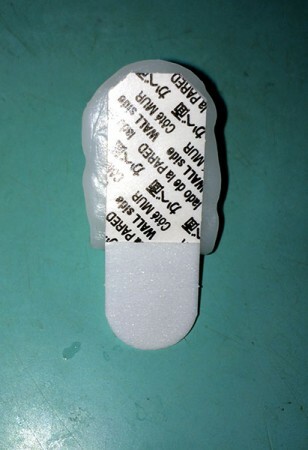 Note that the material is clear while it’s heated and still flexible. This way I could check to make sure it was the correct size for the tape and watch buckle. 3M Command tape on the back of the InstaMorph Pebble Watch holder. InstaMorph Pebble Watch holder with the watchband buckle on it. InstaMorph Pebble Watch holder will hold the charging cable end when not in use. This is why the mount is split. 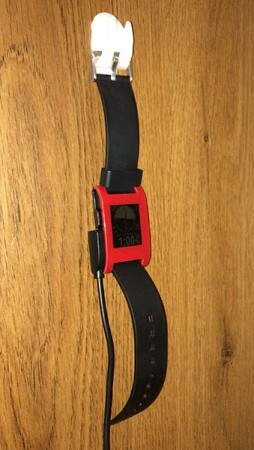 Pebble Watch hanging from InstaMorph holder with charging cable on the side. 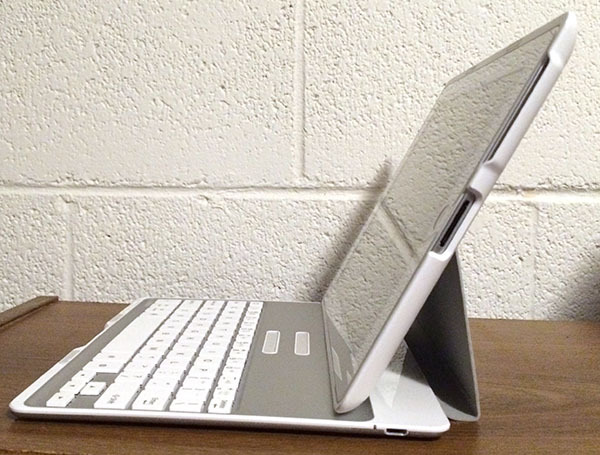 Keyboard case in normal typing position with the iPad. 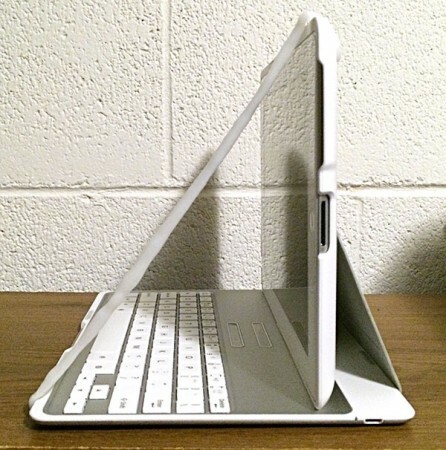 The three positions for the iPad on the case only allow for a tilt-back angle for the iPad. For this project the problem was a proper videoconferencing set-up using my iPad. When we have our Big Island Press Club board meetings I use FaceTime via my iPad to videoconference in people from across the island but my iPad keyboard case, which is great otherwise, is always tilted backwards. Good if the person on the other side wants to see the ceiling or if only one person was videoconferencing on the iPad side but the angle is bad and needs to be 90 degrees so the camera can face the group in the room. I had been propping up my iPad against a wall but it’s difficult as the iPad would fall over and slam shut. InstaMorph to the rescue. I created a long strut made out of InstaMorph, pressed the ends against the top and bottom onto the iPad and keyboard case to mold and cool to get the proper shape and length. Now the angle is proper to videoconference with the group in the room without tilting backwards or in danger of falling shut. An angled view from the front shows how the strut stays out of the way of the screen and camera as it’s in front of the right bezel of the iPad. The top of the screen is now pulled forward to 90 degrees to the table, the front is secure with the strut, the bottom is secure due to the keyboard case magnets, the back is taunt due to the case fabric. Perfect for our next videoconference. I wanted a mount to hold my heavy iPad 3 in the kitchen so it would be easy to view and out of the way of food prep when ingredients and liquids are flying about. This would allow me to easily view recipes and even use it to watch videos or listen to music while cooking and washing dishes. Mounting the iPad to my kitchen cabinet door would be ideal so it would be high up at reading level and away from splashes. It also needed to be secure enough so I could still open and close the door without fear of the iPad from flying to the floor. I have seen wall mounts being sold but they do not accommodate my iPad with its folded back keyboard case which is thick. I needed something that could take the weight of my iPad+Keyboard Case at 2.5 pounds (1.13 kg), the thickness of the combo, ability to hold the iPad in both portrait, landscape and the ability to be mounted without drilling holes. For the bottom holder I used two wire hooks by Command so the adhesive strips would be removable when the time came to do so. Each hook is rated at 5 pounds (2 kg) so with two hooks on the bottom I am only using 25 percent of the rated capacity for weight. I covered the hooks with heat-shrink tubing to cushion the bottom and to create a non-slip surface. These hooks were spaced so they would safely hold my iPad in portrait or landscape. I then created a custom pressure pad hook using InstaMorph that would hold back the top bezel of the iPad. 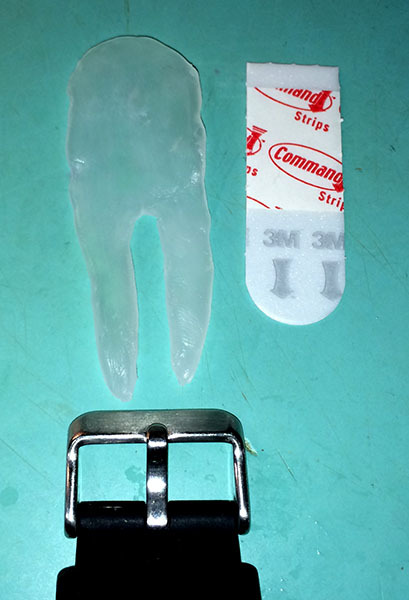 I shaped the vertical mount part of the holder and left it in a flat bowl of hot water while I shaped the pressure pad hook portion using a second bowl of hot water. Then I placed the rectangular mounting surface onto a piece of non-stick aluminum foil on the counter to create a flat back surface and added the pressure pad hook piece melding them together while hot. After it cooled a little I put my iPad, in the open configuration, between the surface mount and pressure pad to let it fully cool so the space between the mount and iPad would be perfect. I later decided to add a little pull handle at the top of the mount to make it easy to pull off. 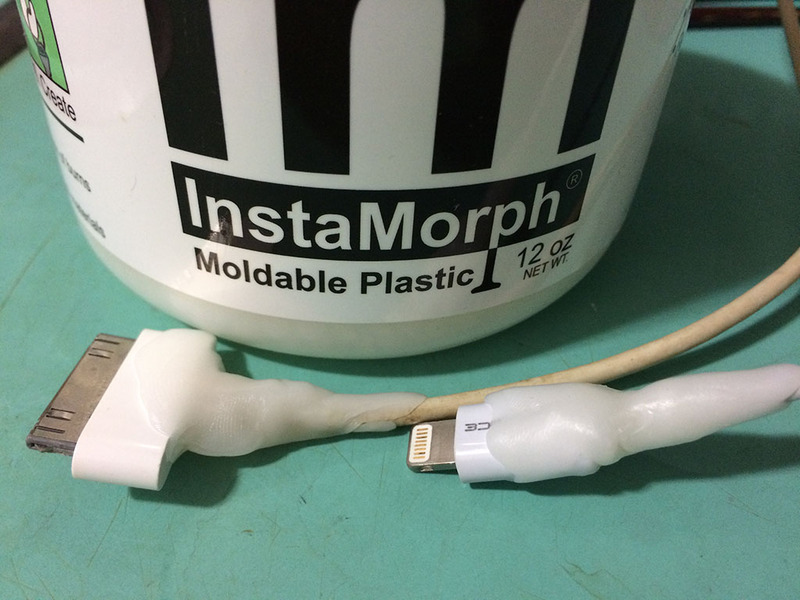 I got more InstaMorph, reheated the top part of the mount and melded the newly shaped pull handle onto it. That’s the great thing about InstaMorph, being able to make changes anytime an idea strikes. When the InstaMorph was cool I added a picture hanging Command Strip to the mount. This Command Strip doesn’t have the fuzzy Velcro type of surface, the surfaces are tiny plastic stubble and it’s rated for 16 pounds (7.26 kg) sheer weight capacity but luckily it less than that when pulled straight off. I’m figuring the lack of the typical Velcro fuzz would be less prone to having tiny fuzzy bits falling into my food prep. Another picture hanging Command Strip went in a position that could accommodate the pressure pad mount when the iPad is in either vertical or horizontal position. You can also offset the position of this Command Strip if you want to have the iPad’s front facing camera available in case you need to Facetime your mom while trying to get her recipe right. Now I don’t have to waste counter space for my iPad or risk it getting splashed. I just place the iPad onto the bottom hangers and secure the top with the pressure pad. It seems to be pretty solid and even without the top pressure pad the iPad will stay on the hangers leaning back against the cupboard door but the custom InstaMorph pressure pad really makes this work securely. I’m going to modify this slightly and position the base of the bezel ‘hook’ to be farther down on the rectangular mount. As it is now when I push the mount onto the cabinet I can only really push on the top 1/3 of the mount since the iPad covers 2/3 of the mount base. Moving the hook further down will allow me to engage more of the ‘velcro’ material. The set-up is quite secure the way it is now and although I can press on the bezel to get more of the mount to engage I’d rather not. Top view of the finished iPad pressure pad with the addition of a little pull tab on the top. Lower side view of the mount. 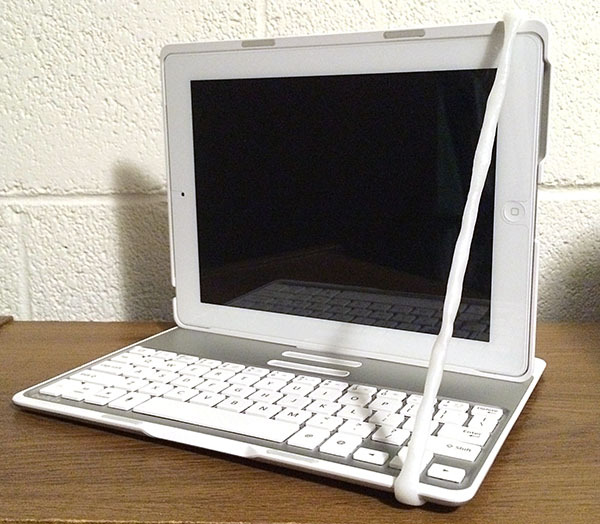 Wire hanger is covered with heat-shrink tubing to prevent slippage and protect the iPad. Upper Command Strip/Velcro and bottom wire hanger mounts in position. I wonder if this stuff could be used in a 3D printer, if needed. The stickiness would probably be the biggest problem. Not for use in a 3D printer which operates at much higher temperatures.